I’m going to review what it is like to use Windows 7 Home Premium on a 2010 MacBook Pro 13 inch. This is one of the 2.4GHz models with 4GB of RAM. Some parts of this review would be applicable for running Windows 7 on any Mac, but other parts may be specific to the 2010 MacBook Pro 13 inch. I installed the 32 bit edition of Windows 7 rather than the 64 bit version on the assumption that more 3rd party software and drivers would be compatible with the 32 bit version. 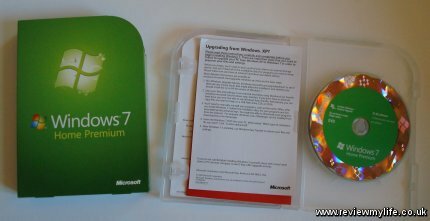 Installing and setting up Windows 7 using Boot Camp is simple and takes less than an hour (most of that time is take by Windows 7 installing and setting itself up). 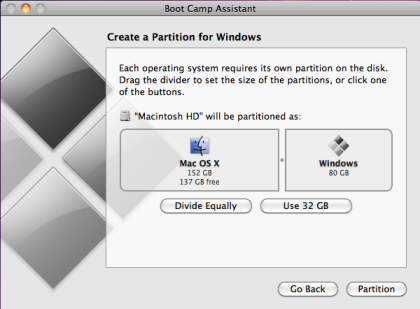 On a previous post I’ve put links to the Boot Camp install instructions. 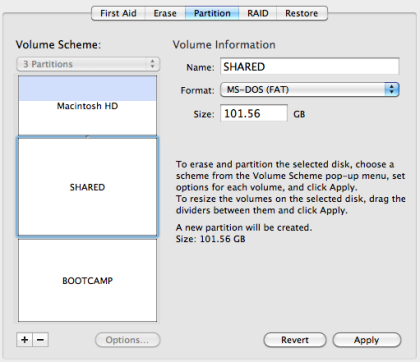 And if you want a writable shared partition I’ve written up my own instructions for how to add a third shared writable partition to your MacBook hard drive. 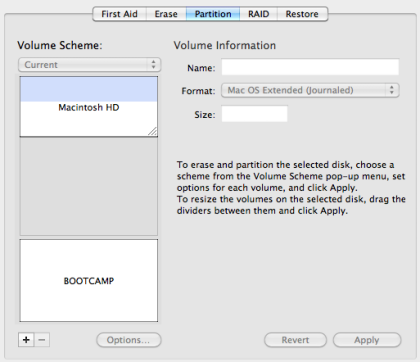 By default the MacBook will boot into Mac OS X. If you hold down the ‘alt’ key when you turn it on you will get boot selection screen in about 10 seconds that will allow you to choose to boot from either the Mac OS X partition or the Windows 7 partition. On choosing Windows 7 it then takes my month old install of Windows 7 48 seconds to reach the login screen. And once I’ve submitted my user details it takes another 15 seconds for the desktop to be fully loaded (with all the taskbar icons in place and for the mouse cursor to be idle). The MacBook has a large multi-touch track pad and Apple have allowed some of the multi-touch functionality to be used in Windows. Moving across the trackpad with a single finger moves the mouse cursor as you’d expect. Moving up and down with two fingers will scroll the current page up and down. As there are no left/right buttons on the trackpad you have to click with a single finger for left-click, and click using two fingers for right-click. You can also configure the track pad to accept a single click in either the bottom left, or bottom right of the screen for the right click. No three or four fingered gestures are supported yet. The keyboard is large and feels good to type with, but it is with the keyboard that you may run into problems when you start using Windows 7. Many of the standard Windows keys that you are used to aren’t on the keyboard. For example there is no Home, End, Page Up, Page Down, Print Screen, Del, or Windows key. Here are the keyboard shortcuts that allow you to get the functionality of these keys on your MacBook Pro. Apple have a larger list of keyboard mappings, but many of them are for other types of Macs and don’t work on the MacBook Pro. Wikipedia has a big list of keyboard shortcuts that you can try as well – but again many of them aren’t applicable to the MacBook Pro keyboard. Apple have been quite stingy with their USB ports. There are only two. If you want to attach more devices you’ll need to plug in a hub. Also both ports are very close together, so if you plug in a USB device with a larger than specification plug, you might not be able to plug in a second USB device. 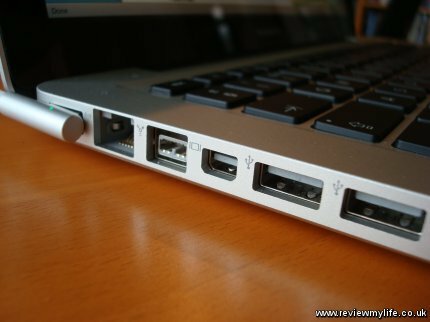 There is a FireWire 800 port as well if you have any FireWire 800 devices to plug in. You won’t find any PC standard VGA monitor plug on the MacBook Pro. There is a Mini DisplayPort instead, so if you want to plug in a VGA monitor, or projector you’ll need to pay extra for an adaptor like this one. The DVD drive, web cam, and SD drive all work as expected on the MacBook Pro. The Windows Experience Index of Windows 7 (with Aero) on the 13 inch MacBook Pro is 5.3. I put more details on my MacBook Pro Windows Experience score page. When booted the usable RAM is 2.74 GB. This is because 32 bit versions of Windows can only address about 3.3GB of RAM. The reason it shows less than 3.3GB is because part of the address space is allocated to other parts of the system (mostly to the graphics card I’m guessing). Using the 64 bit version of Windows 7 would allow more of your RAM to be used by Windows, but I can’t tell you what the 64 bit version of Windows 7 is like as I haven’t tried it. The battery life of the MacBook Pro when running Mac OS X is about 10 hours. When running Windows 7 it is about 4 hours. Still good for a Windows laptop, but it is a shame the battery life isn’t closer to the Mac OS X battery life. Features such as hibernate and standby both work well. 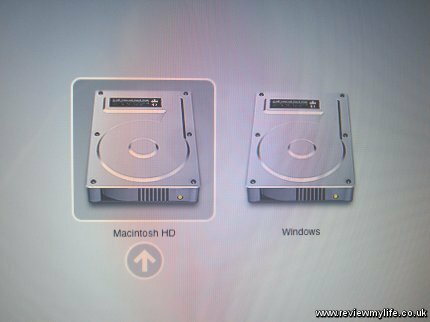 When hibernating you’ll have to make sure you select to boot from Windows on the boot partition selector if Mac OS X is your default OS. In the Windows 7 taskbar (or from the Control Panel) you can access the Boot Camp control panel. It will let you change settings relating to the keyboard mappings, and how the trackpad works. You can set how you activate the right-click for example. Right clicking on the taskbar icon gives you a ‘Restart in Mac OS X’ option. 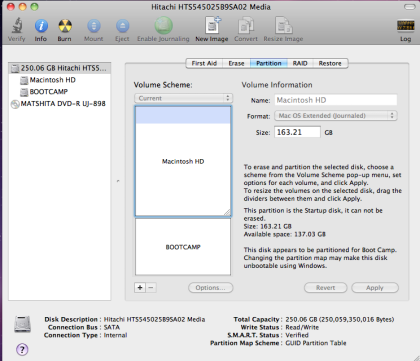 If I find useful utility programs for Windows 7 on a MacBook Pro I’ll list them here. TrackpadMagic – if you are playing a game using a mouse and keyboard, you may find that you accidently hit the trackpad. This free utility will allow you to enable or disable the trackpad easily. You can also configure it to automatically disable the trackpad when you plug in a mouse. 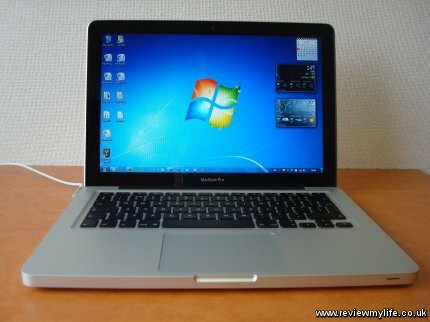 When I got the MacBook Pro a few weeks after it was released there was a problem where no sound came out of the headphone jack in Windows 7 (the headphone socket worked fine on Mac OS X. Apple have now released a patch for this problem – here is the 32 bit version, and the 64 bit version. The most serious problems that I have encountered are complete freezes of the Windows 7 OS. I know I’m not the only person having this problem with running on Windows 7 on Mac OS as a simple Google search will show. In my case I can be using Windows 7 for many hours, and then without warning it will completely freeze. The mouse and keyboard will both stop responding. Sometimes the system will wake up briefly after a few minutes, only to freeze again seconds later. Once it has got into this frozen state I find I need a reboot to fix it. 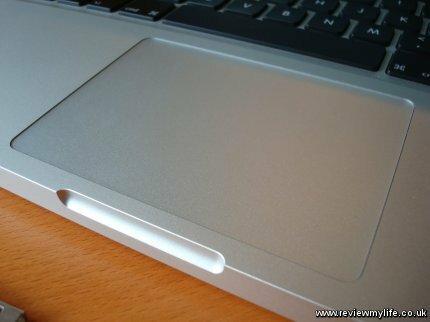 I’ve looked into some of the proposed solutions, but many of them aren’t applicable to the 2010 MacBook Pro 13 inch. What I’m trying at the moment is running Windows 7 with Aero turned off (using the Windows Classic interface). Update 7th July 2010: I’ve now been running Windows 7 with the Classic UI instead of Aero for a month. Since switching to the Classic UI I have had none of the regular freezes that I’d been getting before. It looks like the freeze problems are therefore due to Aero / graphics chip related issues. Fingers crossed that either Apple or Microsoft release an update soon that allows Aero to be used without problems on the MacBook Pro. In the mean time I’m sticking with the Classic UI. Update 30th November 2010: I switched back to Aero 4 days ago and so far no freezes. Looks like the problem is fixed, but I’ll update this post if any more freezes occur. Good points of running Windows 7 on the 2010 MacBook Pro 13 inch. Windows 7 runs smoothly and fast (when it doesn’t freeze). Great screen for Windows applications or video. Much more attractive than any other Windows laptop. Bad points with Windows 7 on the 2010 MacBook Pro 13 inch. The OS freezes after a few hours of intensive use when using the Aero UI (see the above update for the latest details). Some of the standard Windows keys are missing from the keyboard. You’ll need to learn the shortcuts, or use an external keyboard to access them. No Windows standard display display out (e.g. no VGA). Here is a final photo. This is how I use my MacBook Pro at home. 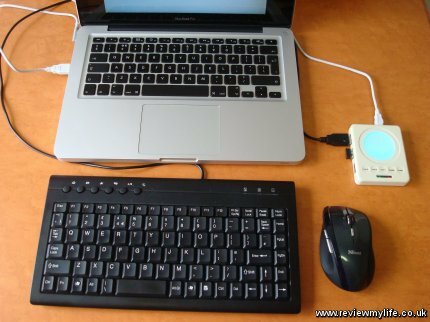 I have an external keyboard, USB hub and wireless mouse. With these extras it doesn’t look as neat, but it is much easier to use. If you want to know how it is packaged look at my MacBook Pro – What’s in the box? post. 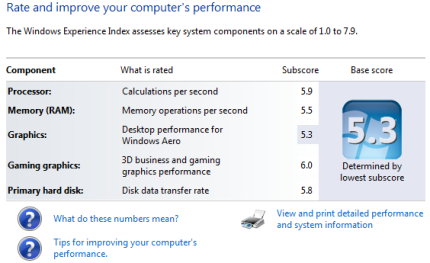 I was recently asked about the Windows 7 Experience Index scores for the 2010 MacBook Pro 13 inch. This is a aluminium unibody MacBook Pro with a 2.4GHz Intel Core 2 Duo processor, 4GB of 1066MHz DDR3 SDRAM, an NVIDIA GeForce 320M graphics chip, and a 250GB 5200 rpm hard drive. I took a measurement of the score shortly after installing Windows 7 on my MacBook (which I did right after buying the laptop), and a few weeks later. The scores were identical. I have left all the default Windows 7 settings in place – for instance I have Aero turned on, and all the visual effects which were enabled by default are still on. Here is a screenshot of the scores. And in case you have images turned off here they are written down. Therefore the overall base score is 5.3. The base score is determined by the lowest of all the scores. If you can’t translate a score of 5.3 into real life, if means that the 2010 MacBook Pro 13 inch is a very good machine for running Windows 7. It is very responsive and quick, even with all the default Aero effects turned on. For more details read my Windows 7 on a MacBook Pro 13 inch review.